Drew Henson is the son of Carol (Flynn) Henson and Dan Henson, a former college football coach at San Jose State, Utah, Arizona State, and Eastern Michigan. Henson once attended Brighton High School in Brighton, Michigan, where he starred in football, basketball, and baseball. In football, he completed 400 passes for 5,662 yards and 52 touchdowns in three seasons. As a sophomore defensive back, he added 47 tackles and five interceptions, and was also an excellent punter. In baseball, he hit a then national prep record 70 home runs, and was named the USA Today High School Player of the Year and the Gatorade High School Player of the Year. Henson, during the recruiting process, was originally planning to commit to Florida State University, but decided against it when Chris Weinke decided to enroll at FSU after a brief stint in Minor League Baseball. Henson instead attended the University of Michigan, where he platooned as starting quarterback with Tom Brady during the 1998 and 1999 seasons. In 1998, Henson accumulated 21 completions on 47 pass attempts, good for 254 yards, three touchdowns and one interception. He saw action in seven of Michigan's 13 games, including a win over #11 Arkansas in the Citrus Bowl. In his sophomore season, Henson saw his number of pass attempts nearly double, throwing 90 times and completing 47 passes. He recorded 546 passing yards, along with three touchdowns and two interceptions in nine appearances. Henson again saw limited action when Michigan took on another bowl opponent with a higher ranking, #5 Alabama, in the Orange Bowl, and came out victorious with a 35–34 OT victory. In 2000, Brady's career at Michigan had ended and Henson, now a junior, served as the Wolverines' starting quarterback for most of the season, appearing in nine of Michigan's 12 games and leading the team to a share of the Big Ten title. Henson threw for a career-high 312 yards in a road defeat to #21 Northwestern, 54–51, but also tie a school record with four passing touchdowns. In the regular season finale, Henson led the #19 Wolverines to Columbus to take on #12 Ohio State and threw again for over 300 yards en route to a 38–26 win. For the third time in his career, Michigan and Henson faced a Southeastern Conference team when Michigan went on to play Auburn in the Citrus Bowl and for the third time, Michigan again emerged victorious, winning 31–28. Henson recorded 294 yards passing on just 15 completions to go with two touchdowns and zero interceptions. Henson ended the season with 146 completions in 237 attempts for 2,146 yards, along with 18 touchdowns and four interceptions. 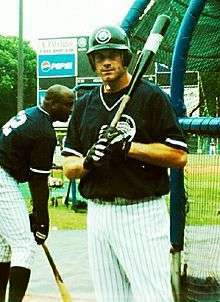 Henson was selected in the third round with the 97th overall selection in the 1998 Major League Baseball Draft. He signed a six-year, $17 million contract to forgo the NFL and play exclusively for the Yankees. He began his minor league playing career with the Tampa Yankees, the Single-A affiliate of the New York Yankees. In his first year of playing, he batted .280 with 13 home runs. He began 2000 with Tampa, and after hitting .333, he was promoted to the AA Norwich Navigators and hit seven home runs before he was traded to the Cincinnati Reds with fellow prospects Jackson Melián and Ed Yarnall for Denny Neagle in 2000. In 2001, he was traded back to the Yankees with Michael Coleman for Wily Mo Pena. However he struggled at the AAA level Columbus Clippers. He hit .234 over three seasons as the Clippers starting third baseman. Frustrated by his lack of progress and in need of a third baseman at the major league level, the Yankees acquired Aaron Boone at the 2003 trading deadline. Boone eventually hit a pennant clinching home run against the Boston Red Sox in the 2003 postseason, but then injured his knee in a pickup basketball game during the offseason. The injury would keep him out for the entire 2004 season. After not being considered by the Yankees to replace Boone at third base and with an opportunity looming in the NFL, Henson announced that he was leaving the Yankees. In 2004, he was released from his contracts, after being unable to negotiate on the buyout of the $12 million still left on his original contract, forcing him to forgo all of it. He played a total of eight games in the majors. He received a token call up with the Yankees in 2002 and playing in three games. He struck out in his only at-bat. In 2003, he played in five games, going one for eight and scoring two runs. He ended his brief major league career with only one hit in nine at-bats (a .111 average) before announcing his retirement in 2003. Henson was originally projected to be a first round selection before deciding to sign with the New York Yankees. The Houston Texans selected him in the sixth round (192nd overall) of the 2003 NFL Draft, to own his rights in case he decided to return to the NFL. After retiring from baseball, he returned to football for the 2004 NFL season. On March 12, he was acquired by the Dallas Cowboys after they traded their third round pick in the 2005 NFL Draft (#73-Vernand Morency) to the Houston Texans. It was later reported that owner/general manager Jerry Jones influenced the organization into making the transaction. After the surprising release of starter Quincy Carter on August 4, he was moved to the backup position behind veteran Vinny Testaverde. On Thanksgiving Day, Testaverde had previously missed practice and was limited with a sore right shoulder, so Henson was given the chance to start his first NFL game. He went 4–12 for 31 passing yards and one interception that was returned for a touchdown in the first half, before leaving the game with the score tied at seven. Head coach Bill Parcells opted to insert Testaverde and the team went on to win the game 21–7. Henson finished the season as a backup with 10 of 18 pass attempts completed for 78 yards and one touchdown. In 2005, Henson had a poor training camp showing and landed third on the depth chart behind Drew Bledsoe and Tony Romo. At the end of the season, Parcells announced that Henson would be allocated to NFL Europe league to work on his skills. In 2006, he was assigned to the Rhein Fire of NFL Europe, where he almost led them to the World Bowl only to finish third behind the Frankfurt Galaxy and the Amsterdam Admirals. He returned to the Cowboys but as waived on August 24, after Parcells decided to keep Bledsoe and Romo as the only two quarterbacks on the roster. On September 27, 2006, Henson was signed to the practice squad of the Minnesota Vikings, but was released on October 10. He was re-signed again by the Vikings on December 6. On March 15, 2007, he was signed a one-year contract, however, he was cut from the team during training camp on August 27. On August 22, 2008, Henson was signed by the Detroit Lions as a free agent. He was waived during final cuts on August 30, but was re-signed to the team's practice squad a day later. Henson was promoted to the active roster on October 12 when quarterback Jon Kitna was declared out for the team's Week 5 contest with an injury. The team released fullback Moran Norris to make room for Henson on the active roster. Shortly after the signing of quarterback Daunte Culpepper, Henson was waived by the Lions on November 12 when the team claimed wide receiver Adam Jennings off waivers from the Atlanta Falcons. Henson was re-signed to the team's practice squad two days later. On November 24, Henson was signed to a two-year contract off the practice squad to become the backup on the depth chart behind Daunte Culpepper. After relieving Culpepper in the 4th quarter of the 2008 Lions' Thanksgiving Day game, Henson was 1-for-2 passing, and fumbled on back-to-back plays. Culpepper also came out of a subsequent game for the final play of the fourth quarter where Henson stepped in and was sacked. He was released by the Lions on April 28, 2009, but not before having been a member of their infamous 0-16 season. ↑ Scott Miller (June 8, 2015). "Once Ticketed for 2-Sport Superstardom, Drew Henson Travels New Big League Path". Bleacher Report. 1 2 3 "Drew Henson". MGoBlue.com. Retrieved December 8, 2010. ↑ "Football Record Book". MGoBlue.com. Retrieved December 8, 2010. ↑ "How he Drew it up". Retrieved February 19, 2016. ↑ "Boone deal hasn't changed Henson's mind". Retrieved February 19, 2016. ↑ "Hurt playing hoops, Boone might miss season". Retrieved February 19, 2016. ↑ "Henson ready to start career in NFL". Retrieved February 19, 2016. ↑ "Former quarterback discussing NFL options". Retrieved February 19, 2016. ↑ "Yankees release IF Henson". Retrieved February 19, 2016. ↑ "Henson cut by Lions". Retrieved February 19, 2016. ↑ "Texans draft former Michigan QB". Retrieved February 19, 2016. ↑ Len Pasquarelli (February 2, 2004). "Henson property of Texans – but available". ESPN.com. Archived from the original on November 4, 2012. ↑ "Vikings agree with Henson, will meet with Scott". ESPN.com. March 15, 2007. Archived from the original on October 15, 2012. Retrieved March 15, 2007. ↑ "QB Henson re-signed to Lions practice squad". USA Today. November 14, 2008.